"We went on four miles, and stopped for noon at Adam Loving's plantation, where we bought ten bushels of corn, and the people were very friendly." After leaving the airport road turn west on Route 58. Turn left on the Old Well Church Road. This road dead-ends at the Mayo and all along it you can see vestiges of the old road cut. After several miles turn right to a cattle gate across a dirt driveway. Stop and look over the gate - you will see the view pictured at right. This is a portion of the actual road that is still used. 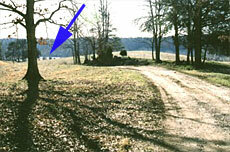 Near the point of the blue arrow stood Adam Loving's house and at the base of the trees in the distance runs the North Mayo River. As recently as 40 years ago a two-story house still stood on or near the site of Loving's home. At that time the property was owned by Ev Adkins - but sadly no one took pictures of the house.